SUBHEAD: Trump, America's Boy King, should know golf and television won't make America great again. Image above: Cover of Newsweek illustrates Trump's Lazyboy lifestyle labeled "Donald Trump is bored and tired. Imagine how bad he'd feel if he did any work." From (http://www.newsweek.com/2017/08/11/donald-trump-hillary-clinton-gop-white-house-potus-bannon-643996.html). President Donald Trump won’t want to hang this uncomplimentary magazine cover at any of his golf clubs. Newsweek depicted the president as a junk food-eating television addict on the front of its next issue, dated Aug. 11. 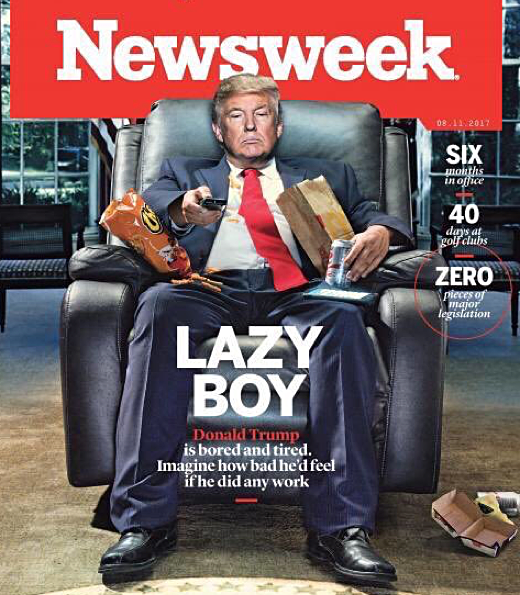 Under the headline “LAZY BOY,” the edited photo shows Trump slumped in a recliner with a remote control in one hand and a Diet Coke in the other. An open bag of Cheetos is perched on his lap while an empty McDonald’s hamburger carton is discarded on the floor. Newsweek shared the cover on its home page late Thursday, two days after it published the cover story itself, which examined “America’s boy king” and his apparent lack of enthusiasm for the job. The image went viral, sparking a myriad of responses. 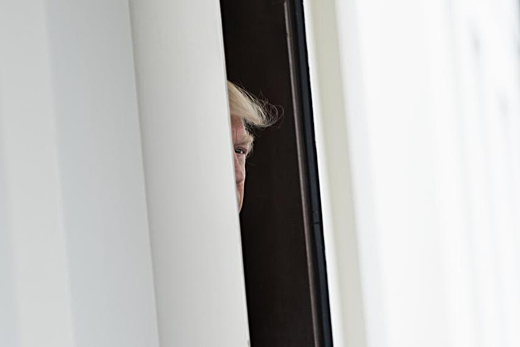 Image above: Could Trump be afraid? From (http://www.newsweek.com/2017/08/11/donald-trump-hillary-clinton-gop-white-house-potus-bannon-643996.html).